Our whole family really enjoys General Mills cereals for breakfast and of course I always save the Box Tops for Education for the kids school. Our favorite would probably have to be Multi-Grain Cheerios. We all like the slight sweetness as well as the delicious whole grain taste and of course their crunch. Our second favorite is Honey nut Cheerios, they have the perfect amount of nut flavor and sweet golden honey. It was fun for the kids to find out that for a limited time select Big G cereals carry a little something extra! If your kids are into super heroes then you need to check this out. Each (read participating cereals list below) box will be packed with action, adventure, and delicious cereal, not to mention a cut-out DC Super Hero mask your child can use to help the Justice League fight crime at breakfast time! Collect all four! Let Big G cereals and DC ENTERTAINMENT feed your family’s bodies and minds while also giving them a super start to their day! 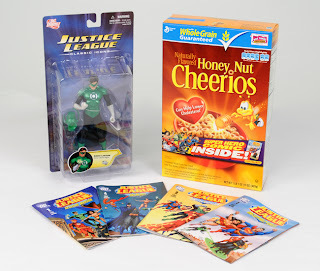 Visit www.BigGCerealHeroes.com for more information on Big G cereals and DC Comics. Disclosure: Product, information, and giveaway have been provided by General Mills and DC ENTERTAINMENT through MyBlogSpark.